Lisbon is the capital of Portugal situated on seven hills at the wide mouth of the river Tagus (Tejo) where it meets the Atlantic Ocean. 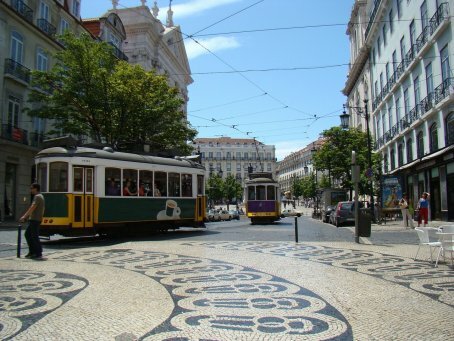 A port city, an economic centre, a cultural powerhouse and a thriving mix of Portugal's rich history and vivid contemporary culture, Lisbon enchants travellers with its white bleached limestone buildings, intimate alleyways, and an easy going charm that makes it a popular year round destination. Lisbon is also the capital of the Lisbon Region, comprising many other splendid tourist destinations such as the UNESCO World Heritage site of Sintra, the seaside resorts of Estoril and Cascais, or Almada famous for its hilltop Cristo Rei statue, all of which are connected with Lisbon by excellent public transportation links. Lisbon enjoys a Subtropical-Mediterranean climate, with mild winters and very warm summers. Strongly influenced by the Gulf Stream it is one of the mildest climates in Europe.